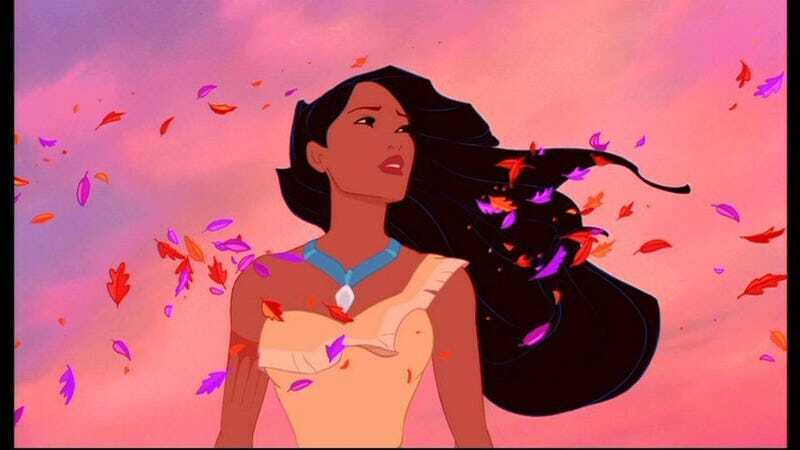 Twenty years ago today Disney released Pocahontas, its 33rd animated feature and seventh princess film. It was something of a turning point in the Disney Renaissance of the 1990s, marking a shift from universally acclaimed films like The Little Mermaid, Beauty And The Beast, and The Lion King to less beloved stuff like Hercules, Mulan, and Tarzan. Despite being the first Disney film to center on a woman of color, it rightfully received a lot of flack for basically ignoring the actual history of Pocahontas (in real life she was only 10 or 11 when she met John Smith) and for basically arguing that colonialism is a-okay so long as the dudes doing it are well intentioned. Still, the film offers up some truly gorgeous sequences (like “Colors Of The Wind”) and remains probably the most high profile story of a Native American in pop culture. In honor of the film’s mixed legacy, here are 20 pieces of related internet ephemera, broken down by category. 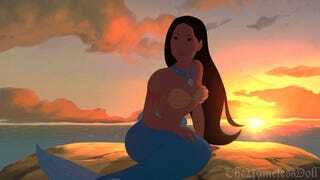 The likes of Mel Gibson, David Ogden Stiers, Linda Hunt, and even Christian Bale lent their voices to Pocahontas. Broadway star Judy Kuhn provided Pocahontas with her singing voice and she recently sat down with Jeanine Tesori (the composer of Fun Home, in which Kuhn currently stars) to recreate “Colors Of The Wind” in various musical styles. Plus Kuhn gave a delightful interview with Entertainment Weekly where she admits she still has no idea what a “blue corn moon” is. Meanwhile, around the time of the film’s release Pocahontas voice actor Irene Bedard hosted this behind the scenes special about the making of the film. Part one is below and you can find part two here and part three here. Not only do people like to draw Pocahontas on paper and build her in sand, they also like to put her image on their bodies. Some go the temporary route with nail art while others really commit with a Pocahontas tattoo. Meanwhile, YouTube is full of tributes including this violin-only version of “Colors Of the Wind,” this rock cover of “Mine, Mine, Mine,” and Disney’s incredibly awkward attempt to make singing along with YouTube videos a thing. And skating fans will enjoy this tribute to Pocahontas from Disney On Ice. Jon Cozart hit it big with his parody video “After Ever After” in which he tarnishes Disney happy endings with darker realities (his Pocahontas section starts at 2:45). Other ways to mark the day include running the hidden pine trails of the forest, tasting the sunsweet berries of the Earth, and, of course, painting with all the colors of the wind.